Unfazed by Trinamool Congress chief Mamata Banerjee�s decision to move a no-confidence against the ruling UPA combine in the winter session of Parliament that commences on Thursday, the government today said it had the numbers to survive the vote. Ahead of the winter session of Parliament scheduled to start on Thursday, a Rajya Sabha select committee today suggested that setting up Lokayukta in states could be delinked from creating the Lokpal at the Centre. It also recommended steps to make the Central Bureau of Investigation more independent. 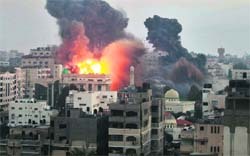 Israel bombarded as many as 80 locations in the narrow Gaza enclave overnight, flattening Gaza's police headquarters and taking the Palestinian death toll to nearly 100 in six days of onslaught. A major tragedy was averted when an airborne private helicopter carrying Kurukshetra Member of Parliament Naveen Jindal developed a technical snag and had to make an emergency landing at Chandigarh airport at 5.32 pm today. The emergency landing led to the cancellation of three outbound flights - JetLite, SpiceJet and GoAir - thereby inconveniencing hundreds of passengers. The Delhi Police today said Ponty Chadha�s attempt to seize the property in possession of his younger brother Hardeep Chadha led to the bloody gunbattle at their Chattarpur farmhouse on Saturday. The police has arrested two persons � Madan Rana and Vijay, alias Malik � in connection with a firing incident on November 17 at another property of the Chadha family at southwest Bijwasan and registered a third FIR on charges of firing and trespass at Bijwasan, said Joint Commissioner of Police (South-Western Range) Vivek Gogia. The Delhi High Court today rejected the bail plea of former Haryana Minister Gopal Goyal Kanda, arrested on the charge of driving his former air hostess Geetika Sharma to commit suicide on August 5. Authorities in Karnataka are expected to bid for an historic 19th century state carriage that once belonged to the royal family of Mysore and is now up for sale at a public auction in the UK.